Assuming random (1-bit) inputs, the AND function output probability distribution is 25% 0 and 75% 1. Conversely, OR is 75% 0 and 25% 1. 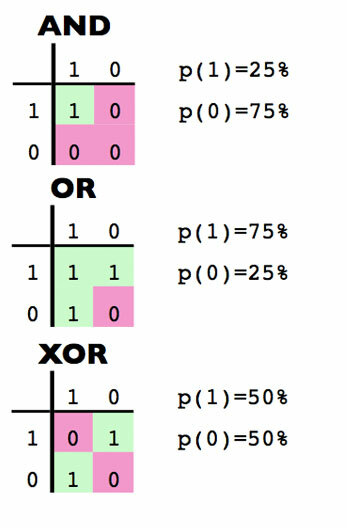 The XOR function is 50% 0 and 50% 1, therefore it is good for combining uniform probability distributions. If you are combining two random bits with AND you have a 75% chance of 1. Similarly, if you combine two random bits with OR you have a 75% chance of 0. [When combining hashes] essentially you want an operation that maximizes entropy since lower entropy implies the hash is storing less data than it appears. That bias means each bit is storing slightly less information (since that bias is present). Summary: If you need to combine two hashes, XOR them together and you’ll have a better chance at maintaining the entropy of the original hashes. Rob runs the L.A. Machine Learning meetup group. If you’re in L.A. AND interested in machine learning, stop by sometime. This is because DocA and DocB have the same hash. If these two lists should have different hashes, then a different technique is required. Google brought me here, because I didn’t understand the use of XOR in Ryan Moulton’s article. I understand now, thanks for the explanation! I have a question regarding calculating the final hash. Did you try (weighted or not) adding/subtracting of bits of hash values of features as suggested in  instead of XORing hashes? If so, can you share your thoughts comparing both approaches? Ryan Moulton’s article mentions  in Further Reading section. The reason I ask is that in my simple tests, I find XORing to combine hashes of features doesn’t result in smaller Hamming distances for similar documents. I believe you got your 1s and 0s mixed up in the actual text there. The diagram represents what I would expect. Zachary! You’re totally right, I’ll have to update that.